Sometimes, two letters are worth 1000 words. We are grateful for Senator Lugar and Congressman Carson’s support and advocacy of the impact youth are making to increase digital inclusion! 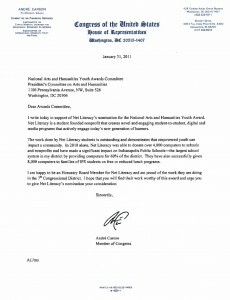 We are grateful that the Indiana Humanities Council nominated Net Literacy for this prestigious event awarded at the White House, and that Dr. Greenwood seconded the nomination. 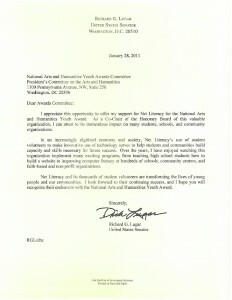 Thank you for your advocacy of teens engaged in the humanities through service learning!